Home » Articles » Is the Album Doomed? In a recent article by Tim Ingham for Rolling Stone, some startling statistics pointed to further erosion of the music model of the past, as consumption patterns continue to swing further toward single tracks. According to the Recording Industry Association of America (RIAA), album sales in the US for the first half of 2018 (including downloads, CDs, and vinyl) were down 25.8%, compared to a year earlier. If that trend holds for the full year, album sales will be half of what they were in 2015, or in terms of dollars, down by half a billion dollars compared to last year. The CD album is bearing the brunt of this damage. After a comfortable 6.5% drop in sales in 2017, in the first half of 2018, revenues generated by the CD album in the US were slashed nearly in half—down 41.5% to $246 million. 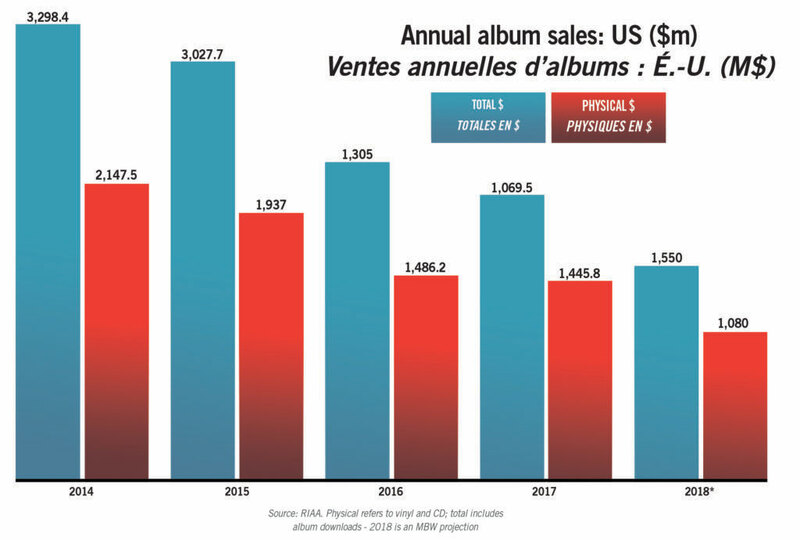 2018 will go down as a landmark year for the acceleration of the decline in physical album sales. Meanwhile, some of hip-hop’s biggest names released hotly anticipated new LPs, but exclusively on digital services for the first week. Physical formats were made available only after the initial rush was over. This new approach speeds the demise of not only the CD, but also brick-and-mortar retailers. Before we get too mired in what that ultimately means, it’s interesting to note that this is not the case worldwide. In tech-savvy Japan, for instance, physical sales still account for 87%. It seems the Japanese, much like Canadians and Americans of yore, still want to feel the product in their hands, view the artwork, read the lyrics and other jacket information, and then display it prominently in their home. However, it’s only a matter of time before they too yield to the ease of playlists. Another telling statistic lies within the release of Drake’s album Scorpion, the hottest recording in the US this year, which is an astounding 25 tracks long. The lion’s share of the streams on Spotify come from only three tracks. What does that mean? Is it possible that, as the industry returns to the pre-Beatles era of track-led consumption, fans are being encouraged to develop a less-committed relationship with the artist? Has the industry, in its zeal to monetize streaming to the max, sacrificed something more valuable that it could have realized? And in their rush to rack up streams, have the artists forgotten about pacing an album, or creating a beginning to end experience, in favour of recording more “filler content”? On October 13, the UK music business launched a nationwide campaign called National Album Day, as the major labels, independents, and music retailers, with radio coverage from the BBC, pushed to encourage album sales through public awareness. Incredibly, UK album sales fell slightly during that week, the strongest bellwether yet of what the music industry has done, in its collective, corporate-minded greed. It has turned the work of musical artists into virtual store-shelf trinkets, single-packet items stacked at the end of the aisle for immediate clearance. At this time, I would like to extend best holiday wishes for peace, love, and solidarity to all our members and their families, from the entire staff of the Canadian Office. May 2019 be productive and prosperous for all of us in the labour movement.